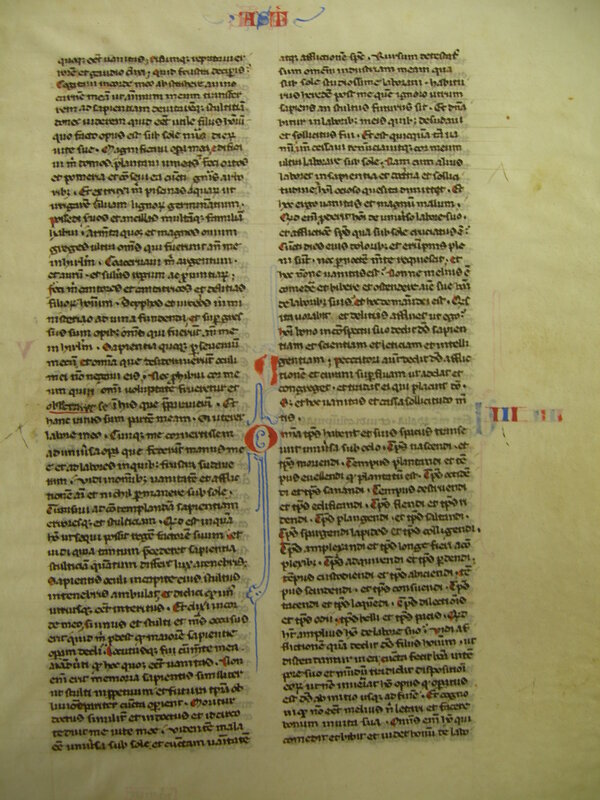 This leaf is from an Italian bible of the 13th century. It measures 19.5 x 13cm and the vellum is thin and supple, with minimal yellowing. It is lined with plummet, and includes blue, red, and black ink. The text is rotunda gothic. Though not illuminated, the leaf includes decorative initials with flourishes, as well as red and blue book numbers and chapter names. The first letter of most verses is pricked out in red. 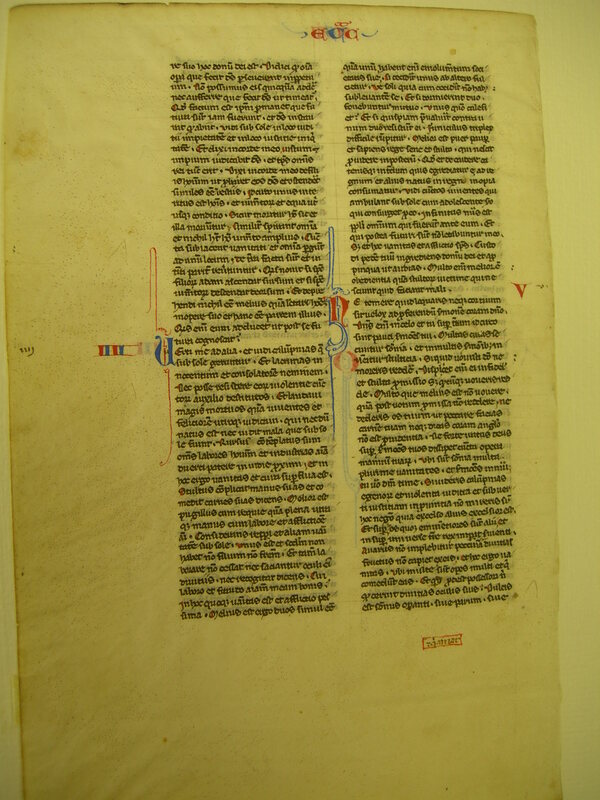 See Denison University Leaf 11 for more information about this manuscript. Text: Ecclesiastes 2:1-3:13 (recto) and 3:13-5:11 (verso). And I saw that this also was vanity. 2 Laughter I counted error: and to mirth I said: Why art thou vainly deceived? 3 I thought in my heart, to withdraw my flesh from wine, that I might turn my mind to wisdom, and might avoid folly, till I might see what was profitable for the children of men: and what they ought to do under the sun, all the days of their life. 4 I made me great works, I built me houses, and planted vineyards, 5 I made gardens, and orchards, and set them with trees of all kinds, 6 And I made me ponds of water, to water therewith the wood of the young trees, 7 I got me menservants, and maidservants, and had a great family: and herds of oxen, and great flocks of sheep, above all that were before me in Jerusalem: 8 I heaped together for myself silver and gold, and the wealth of kings, and provinces: I made me singing men, and singing women, and the delights of the sons of men, cups and vessels to serve to pour out wine: 9 And I surpassed in riches all that were before me in Jerusalem: my wisdom also remained with me. 10 And whatsoever my eyes desired, I refused them not: and I withheld not my heart from enjoying every pleasure, and delighting itself in the things which I had prepared: and esteemed this my portion, to make use of my own labour. 11 And when I turned myself to all the works which my hands had wrought, and to the labours wherein I had laboured in vain, I saw in all things vanity, and vexation of mind, and that nothing was lasting under the sun. 12 I passed further to behold wisdom, and errors and folly, (What is man, said I, that he can follow the King his maker?) 13 And I saw that wisdom excelled folly, as much as light differeth from darkness. 14 The eyes of a wise man are in his head: the fool walketh in darkness: and I learned that they were to die both alike. 15 And I said in my heart: If the death of the fool and mine shall be one, what doth it avail me, that I have applied myself more to the study of wisdom? And speaking with my own mind, I perceived that this also was vanity. 16 For there shall be no remembrance of the wise no more than of the fool for ever, and the times to come shall cover all things together with oblivion: the learned dieth in like manner as the unlearned. 17 And therefore I was weary of my life, when I saw that all things under the sun are evil, and all vanity and vexation of spirit. 18 Again I hated all my application wherewith I had earnestly laboured under the sun, being like to have an heir after me, 19 Whom I know not whether he will be a wise man or a fool, and he shall have rule over all my labours with which I have laboured and been solicitous: and is there any thing so vain? 20 Wherefore I left off and my heart renounced labouring any more under the sun. 21 For when a man laboureth in wisdom, and knowledge, and carefulness, he leaveth what he hath gotten to an idle man: so this also is vanity, and a great evil. 22 For what profit shall a man have of all his labour, and vexation of spirit, with which he hath been tormented under the sun? 23 All his days are full of sorrows and miseries, even in the night he doth not rest in mind: and is not this vanity? 24 Is it not better to eat and drink, and to shew his soul good things of his labours? and this is from the hand of God. 25 Who shall so feast and abound with delights as I? 26 God hath given to a man that is good in his sight, wisdom, and knowledge, and joy: but to the sinner he hath given vexation, and superfluous care, to heap up and to gather together, and to give it to him that hath pleased God: but this also is vanity, and a fruitless solicitude of the mind. ...this is the gift of God. 14 I have learned that all the works which God hath made, continue for ever: we cannot add any thing, nor take away from those things which God hath made that he may be feared. 15 That which hath been made, the same continueth: the things that shall be, have already been: and God restoreth that which is past. 16 I saw under the sun in the place of judgment wickedness, and in the place of justice iniquity. 17 And I said in my heart: God shall judge both the just and the wicked, and then shall be the time of every thing. 18 I said in my heart concerning the sons of men, that God would prove them, and shew them to be like beasts. 19 Therefore the death of man, and of beasts is one, and the condition of them both is equal: as man dieth, so they also die: all things breathe alike, and man hath nothing more than beast: all things are subject to vanity. 20 And all things go to one place: of earth they were made, and into earth they return together. 21 Who knoweth if the spirit of the children of Adam ascend upward, and if the spirit of the beasts descend downward? 22 And I have found that nothing is better than for a man to rejoice in his work, and that this is his portion. For who shall bring him to know the things that shall be after him? 1 I turned myself to other things, and I saw the oppressions that are done under the sun, and the tears of the innocent, and they had no comforter; and they were not able to resist their violence, being destitute of help from any. 2 And I praised the dead rather than the living: 3 And I judged him happier than them both, that is not yet born, nor hath seen the evils that are done under the sun. 4 Again I considered all the labours of men, and I remarked that their industries are exposed to the envy of their neighhour: so in this also there is vanity, and fruitless care. 5 The fool foldeth his hands together, and eateth his own flesh, saying: 6 Better is a handful with rest, than both hands full with labour, and vexation of mind. 7 Considering I found also another vanity under the sun: 8 There is but one, and he hath not a second, no child, no brother, and yet he ceaseth not to labour, neither are his eyes satisfied with riches, neither doth he reflect, saying: For whom do I labour, and defraud my soul of good things? in this also is vanity, and a grievous vexation. 9 It is better therefore that two should be together, than one: for they have the advantage of their society: 10 If one fall he shall be supported by the other: woe to him that is alone, for when he falleth, he hath none to lift him up. 11 And if two lie together, they shall warm one another: how shall one alone be warmed? 12 And if a man prevail against one, two shall withstand him: a threefold cord is not easily broken. 13 Better is a child that is poor and wise, than a king that is old and foolish, who knoweth not to foresee for hereafter. 14 Because out of prison and chains sometimes a man cometh forth to a kingdom: and another born king is consumed with poverty. 15 I saw all men living, that walk under the sun with the second young man, who shall rise up in his place. 16 The number of the people, of all that were before him is infinite: and they that shall come afterwards, shall not rejoice in him: but this also is vanity, and vexation of spirit. 17 Keep thy foot, when thou goest into the house of God, and draw nigh to hear. For much better is obedience, than the victims of fools, who know not what evil they do.